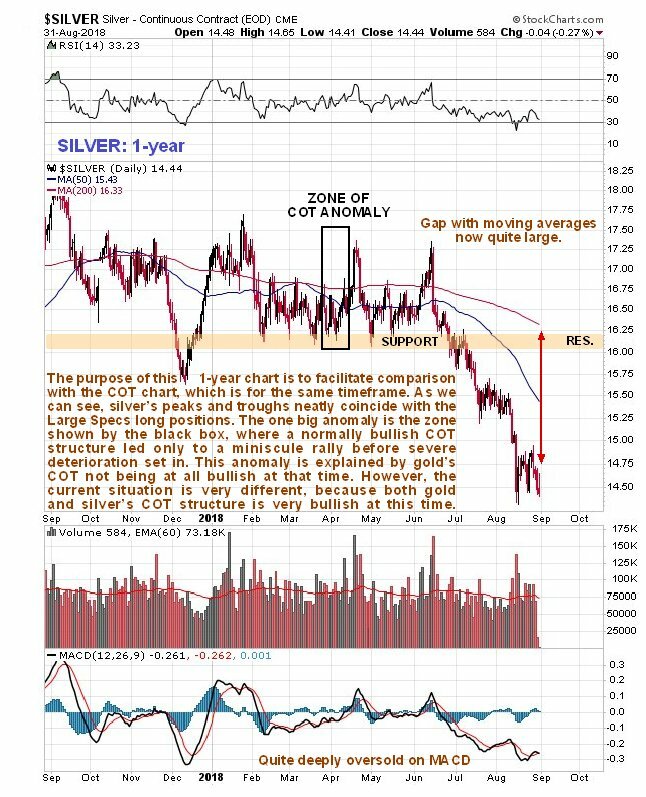 Technical analyst Clive Maund charts gold and silver and finds some positive signs. If you want to understand the great mass of investors, you don’t need to spend hours reading a book written about a hundred years ago, the best way way to do it is to treat yourself to some time watching sheep. You can even make something of a vacation of it by going along to a sheep dog trial, such as the classic ones held on the EnglishWelsh borders in the heart of sheep country or in New Zealand. It’s a fun day out and you can learn from chatting with the farmers, and more to the point, you can learn a lot about investors by watching the sheepdogs and the sheepall you have to remember is that the sheepdogs are the Smart Money and the sheep represent the great mass of investors, the so-called Dumb Money. If you do go to the sheepdog trials on the EnglishWelsh borders, remember to tag on a day or two to visit nearby Hay-on-Wye, which is stuffed full of secondhand bookshops where you can find some great old books, and mercifully very few of them are written in Welsh. Fortunately, we can readily identify the sheepdogs and the sheep on our COT charts, the sheepdogs are the purple bars on our charts, the Commercials, who take the other side of the trade from the sheep, who are the blue bars, the Large Specs. 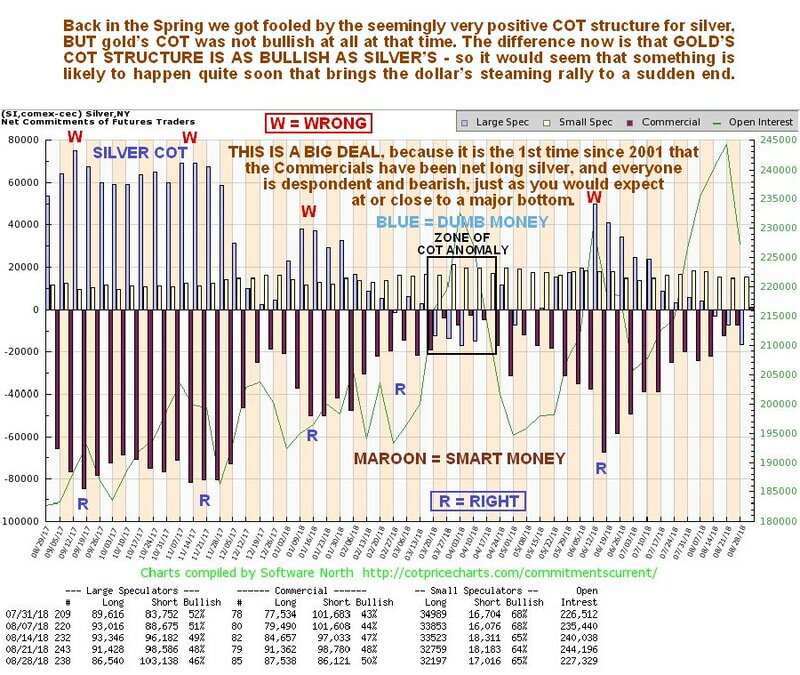 Let’s now look at a pair of charts, a 1-year chart for silver itself with the COT chart stacked directly below it, which is for 1-year too, in order to see how the sheep are always wrong. As we can see the sheep, the Large Specs (blue bars) always have their biggest long positions at or just ahead of peaks in the silver price. This is not rocket science, is it? To assist you in grasping this, an appropriate number of right and wrong labels have been added to the chart. While the obvious conclusion from this is that the Large Specs are just plain stupid, dumber than the dumbest jackass, as pragmatic speculators we do not waste our time condemning them, rather, we simply make sure that we are the opposite side of the trade from these clowns, and if they are going short silver to a significant degree, as they did last week, then we are going to make darn sure that we are long. If we are a little too early, and silver drops some more, then so what? The entire financial system is set to blow to smithereens before much longer, and the Emerging Markets collapse is just the start of itthe periphery is burning and the firestorm will soon spread towards the center. When that happens there are going to be “precious” few hiding places, and the Precious Metals sector will be one of the only boltholes around. Before leaving these charts it is also worth noting that the Commercials went long silver for the first time since 2001 last week, and if that isn’t a sign of an imminent bull market, then I don’t know what is. Incidentally, with respect to the classic 1948 goldbug film with Humphrey Bogart, “Treasure of the Sierra Madre,” those of you who play casino slot machines may not realize that the refrain “Bonus? We don’t need no stinking bonus!” that the “My Caramba” machine says in a thick Mexican accent when the bonus is cut short, is actually inspired by the “Badges? We don’t need no stinking badges!” scene in the “Treasure of the Sierra Madre,” but I digress. . .
Click on chart to pop-up a larger, clearer version. 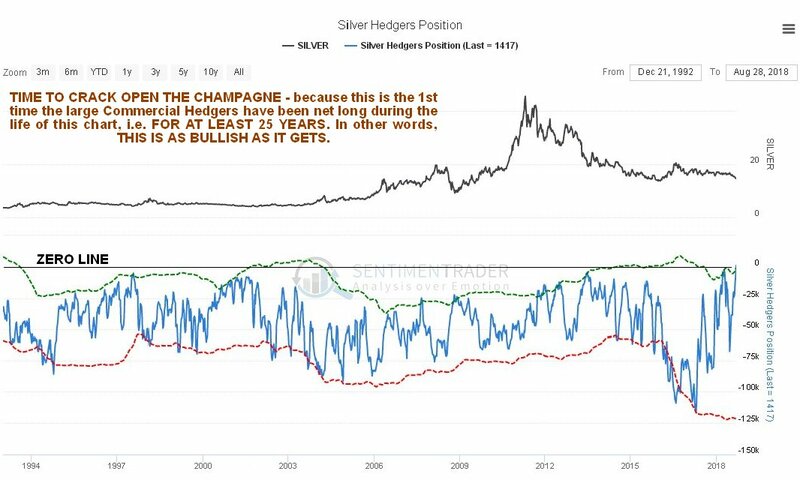 The net Commercial Hedgers chart is also unprecedentedly bullish, as it shows that this is the first time during the life of this chart, i.e., for the past 25 years at least, that they have held a net long position: put simply it doesn’t get any better than this. The 6-month chart for silver shows recent action in more detail. 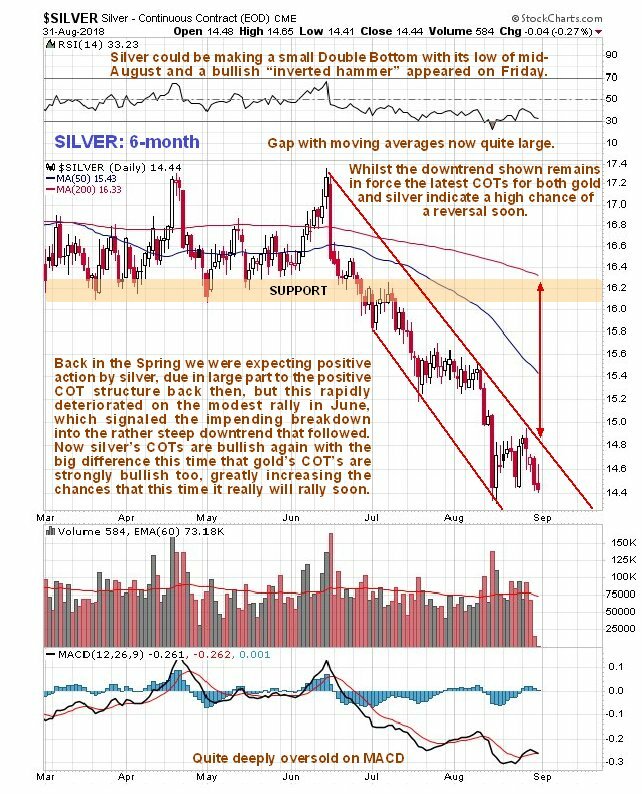 On this chart we can see that last week’s dip brought the silver price back close to its mid-August lows, with which it is suspected to be forming a small Double Bottom, and a bullish-looking “inverted hammer” candle appeared on Friday, so we might be right at the bottom here. 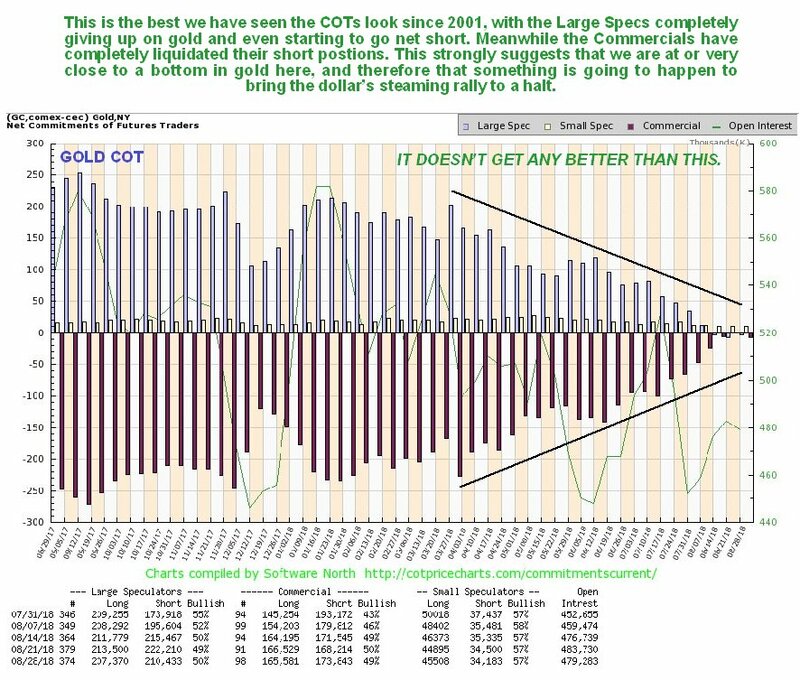 Finally, unlike back in the spring, gold’s latest COT chart is also very bullish. This monthly chart for dollar proxy UUP shows a bearish monthly “shooting star” for the month of August and money flow becoming negative in recent weeks, indicating that Smart Money have been taking profits in dollar trades. It also shows a big ugly potential Broadening Top. According to this chart the dollar is about to turn lower. 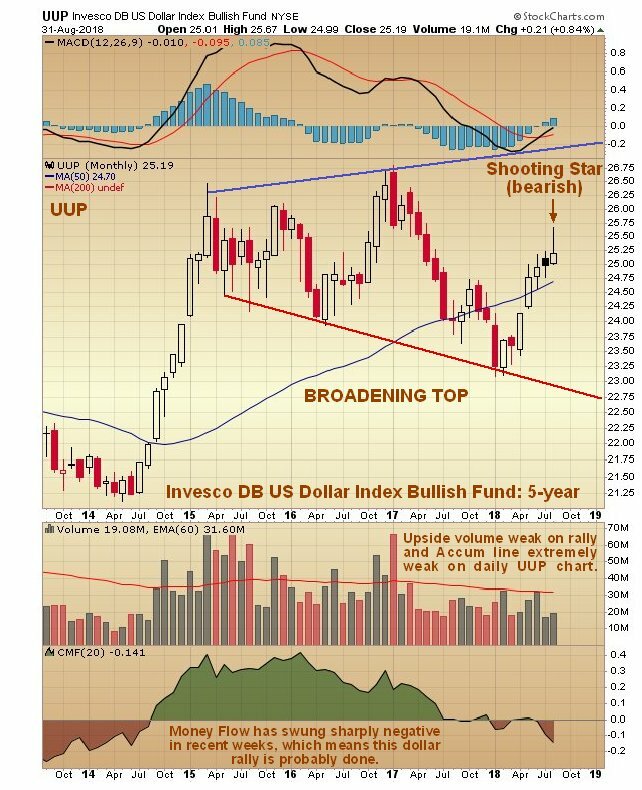 It is also worth noting that the Accumulation chart for UUP on its daily chart has been extremely weak on this rally. The conclusion to all this is that the coast is clear to accumulate the precious metals sectoreven if the sector drops more, it is unlikely to be by much. That’s what Smart Money is already doing, and they are going to be sitting pretty and not have to give chase if the sector goes roaring up. At this juncture it is probably best in general to accumulate the large to mid-caps, since they are unlikely to drop much more if the sector grinds a bit lower, whereas as we know, some juniors can easily get another 30% lopped off their prices if the sector goes nowhere and there is no positive news out of the individual companies. We will accordingly be reviewing the charts for a range of large and mid-cap gold and silver stocks as a matter of priority going forward. 1) Statements and opinions expressed are the opinions of Clive Maund and not of Streetwise Reports or its officers. Clive Maund is wholly responsible for the validity of the statements. Streetwise Reports was not involved in the content preparation. Clive Maund was not paid by Streetwise Reports LLC for this article. Streetwise Reports was not paid by the author to publish or syndicate this article. 3) From time to time, Streetwise Reports LLC and its directors, officers, employees or members of their families, as well as persons interviewed for articles and interviews on the site, may have a long or short position in securities mentioned. Directors, officers, employees or members of their immediate families are prohibited from making purchases and/or sales of those securities in the open market or otherwise from the time of the interview or the decision to write an article, until one week after the publication of the interview or article.